Create a report called A History Of Violence, add a data source which connects to the Movies database and create a dataset which includes these fields. Add a filter to return war films, i.e. those with a GenreID of 5. 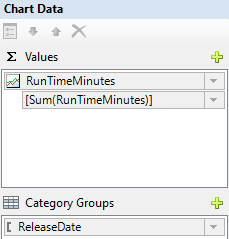 It doesn't matter which aggregate function you apply to the RunTimeMinutes field in this example. 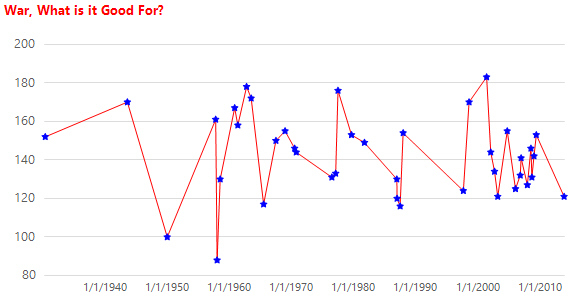 Format the chart's horizontal axis to use the Scalar type. Set its interval to 10 with a type of Years. Format the vertical axis so that it begins at 80. Feel free to improve on these basic formatting choices. Close and save the report.